Game Masters shouldn�t waste their time drawing overgrown ruins and tangled undergrowth every time the player characters venture into the jungle. 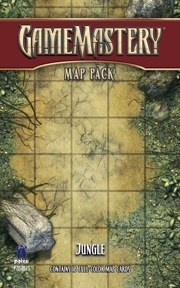 With GameMastery Map Pack: Jungle, you�ll always be ready for what the PCs might find in this inescapable wilderness! For use with all tabletop roleplaying and miniatures games and usable by experienced GMs and novices alike, this product fits perfectly into any Game Master�s arsenal.